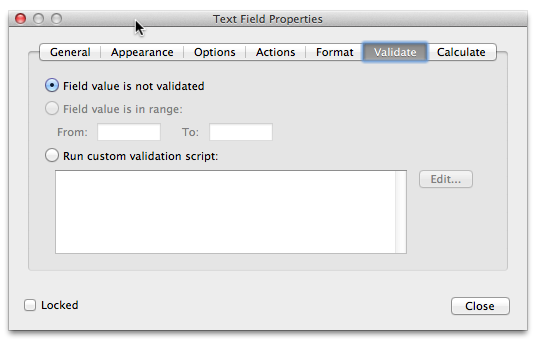 One of the questions I get asked again and again is how to validate a field value in an AcroForm with a custom validation script. Adobe provided a lot of infrastructure to do that with just a simple script. Let’s take a look at how to do that with a text field that is only supposed to have a value of either ‘AAAA’ or ‘BBBB’ (yes, I know that this does not make much sense in a real PDF form). So, if the user enters ’01234' we should see an error message that would instruct the user about what type of data is valid for this field. This tutorial assumes that you are using Adobe Acrobat XI Pro, but with just minor adjustments, you can use this with Acrobat X, and even older versions. As I mentioned before, information is passed to the validation function in the event object, and in the code we see that the member ‘value’ is used to communicate the current value of the field. The member variable ‘rc’ (or return code) is used to communicate back if the validation was successful or not. In the latter case, we set rc to false, and also display an error message. When you play around with the function, you’ll notice that the validation function is only called when the focus leaves the field, so you have to click outside of the field to actually make that error message pop up. In that case, the previous value of the field is restored, and the user has to enter the data again. Using this method has implications on the form submission process: The form no longer can verify that the data is correct, so the submission function needs to do another round of validation to see if any of the required fields are not correct (one way to do that is to test all relevant fields to see if the text color is using the error color, or we can use global variables to store the validation state). Another thing I like to do is to display the validation error message on the form in an otherwise hidden field: The problem with our last solution is that if the user saves a partially filled form, and picks it up at a later time, that error message that popped up is long gone, and the only indication that there is something wrong with the form is the modified field color. So, having a text field contain that error message might be a good idea. There are other ways to highlight the field in question besides changing the text color, the border color or the fill color could be changed instead, or in addition, just make sure that you are not making the form impossible to read. 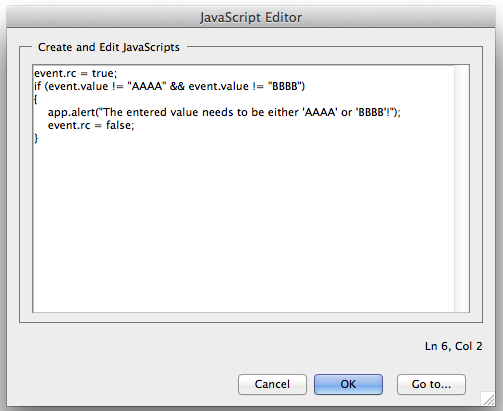 To learn more about the event object, take a look at http://livedocs.adobe.com/acrobat_sdk/10/Acrobat10_HTMLHelp/JS_API_AcroJS.88.560.html – make sure to click on the button in the upper left corner to display the navigation pane if it’s not shown automatically.